Meghan Duchess of Sussex, and Prince Harry Duke of Sussex, leave Windsor Castle after their wedding to attend an evening reception at Frogmore House on May 19, 2018 in Windsor, England. It may not be the dress that will make it into the annals of British history, but for wearability and relaxed elegance, it was Her Royal Highness Meghan’s second dress on her wedding day that was the star. The high-necked silk halter dress was created by British designer Stella McCartney, and in response to all the knockoffs it immediately spawned, she’s now made a variation of the gown available to the public. But even in synthetics, dressing like the Duchess of Sussex doesn’t come cheap. 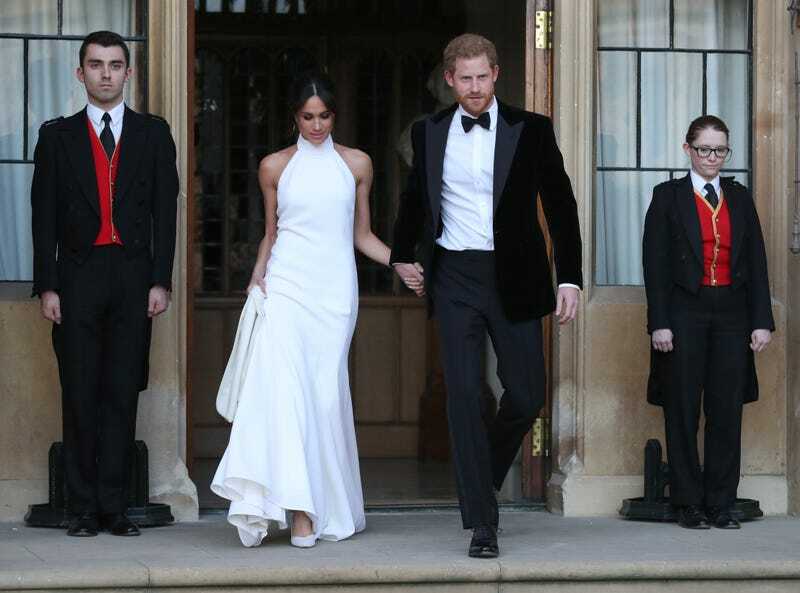 Authentically channeling Meghan’s minimalist look on your big day will set you back $5,200—a bargain, considering that the original was estimated to cost $157,000.